The videogame that made the rooster hat a worldwide phenomenon is coming back for another go later this year. 5th Cell's Scribblenauts for the Nintendo DS was not only a technological feat, allowing players to write almost anything they wished to have it appear in-game, but also a fun and unique experience that was able to sell a decent amount of copies. Due to its popularity, a sequel is now in the making, with first details revealed through NeoGAF that come from the next issue of Nintendo Power. Some of the new information was confirmed by a 5th Cell employee that frequents the forum. 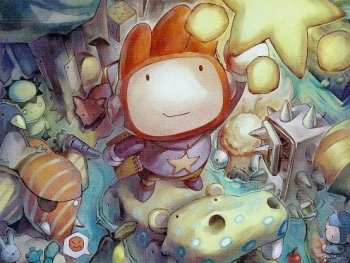 Scribblenauts 2 is planned for release in Fall 2010, and like its predecessor will be only available on the Nintendo DS. 5th Cell is rumored to have a console title in the works, but it appears it will not be the immediate sequel to Scribblenauts at this time. Scribblenauts 2 will add 10,000 new words, but they will be adjectives rather than objects. Adjectives can be strung together, presumably leading to creations like "angry, orange monkey," as opposed to just plain old "monkey." The controls will see improvements, both with the DS' stylus and buttons, as players will now have the ability to use the D-pad to move Maxwell, the game's main character. Scribblenauts 2 will also have a fixed camera. Reportedly, at least 120 new levels will be added, and they will be improved in design. As the employee stated on NeoGAF, there will be "no more solving every level with rope/unicorn/death/etc," and each will be "deeper in content." The game's physics have been updated, the level editor improved, the par system may be removed, more merits have been added, and there will also be a new hint system. So, fans of emergent gameplay, and battles between Cthulu and God, should have something new to look forward to this Fall.